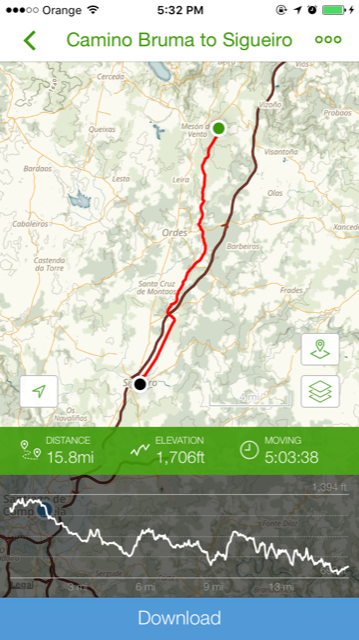 Continued from Sigüeiro to Santiago. 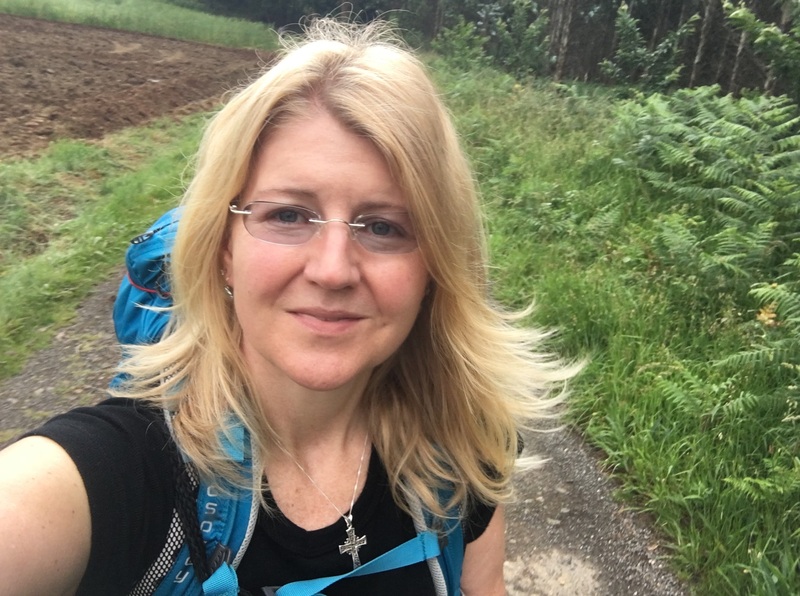 When I started my walk from Sigüeiro, it was sunny and warm, but by the time I reached Santiago, the sky was grey and it felt like it would rain at any moment. This was exactly like my arrival in Santiago last year after walking the Camino Portugués. However, I was in a completely different state of mind this time, having learned a great lesson. I had prebooked a room so I wasn’t desperately trying to find a bed for the night. This time around, I didn’t care if it poured; I was going straight to Praza do Obradoiro by the Cathedral. I headed right for the center of Praza Obradoiro and felt a euphoric sense of joy rush over me. I made it. 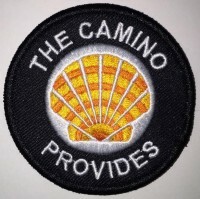 My second Camino. And I was so high on life! Below is a video of my arrival. 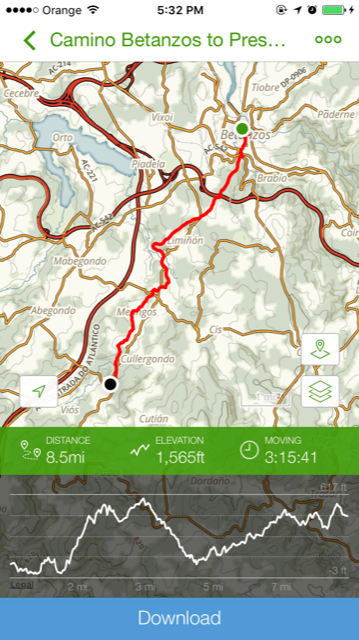 Continued from Bruma to Sigüeiro. 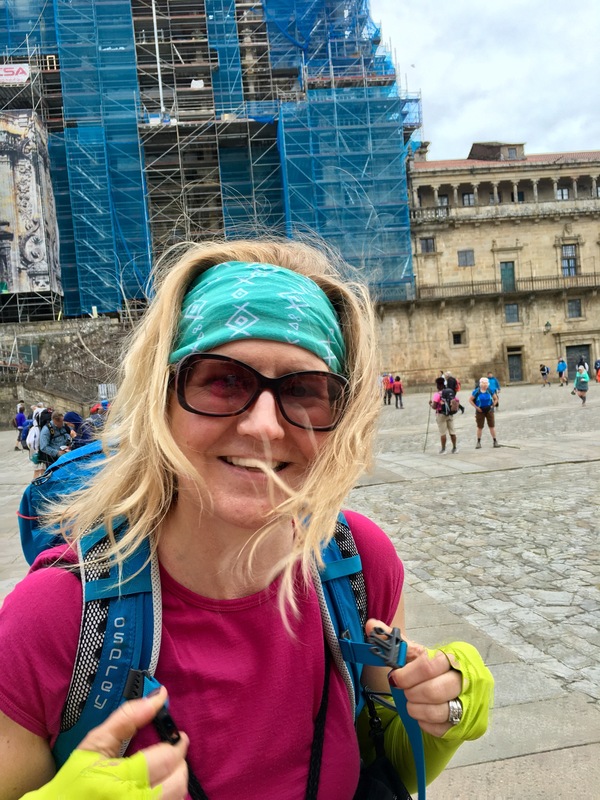 Santiago or bust! 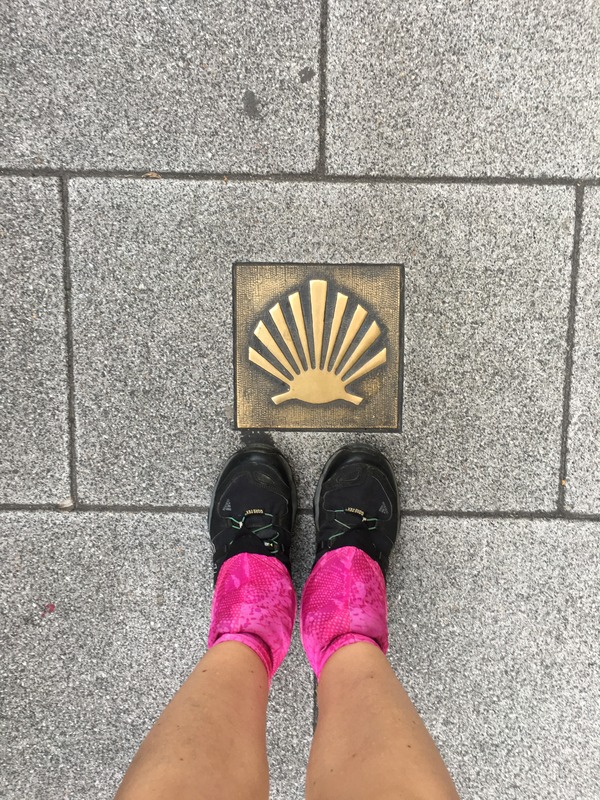 This was the seventh, and final, day of walking the Camino Inglés. And I was just getting warmed up! 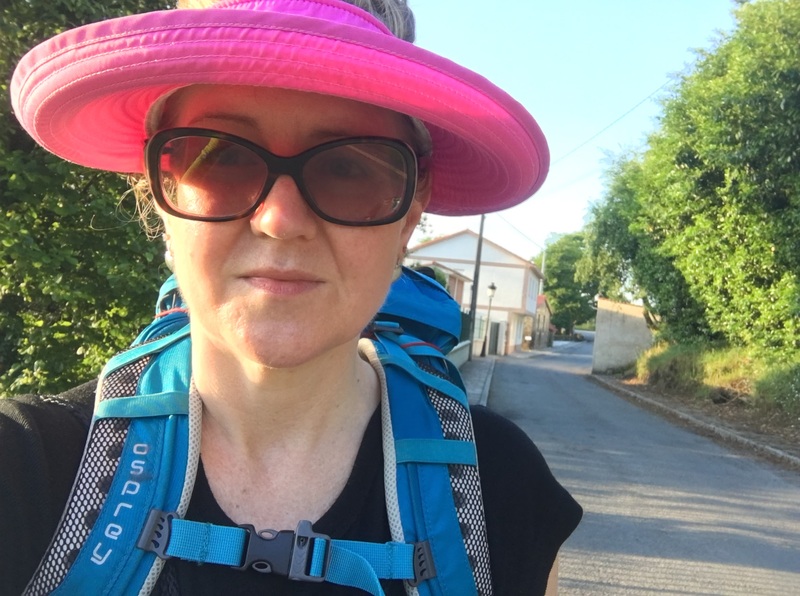 Until I have enough time off work to walk a longer Camino, these shorter variations satisfy the calling. First stop, Restaurante Cortés, across the street from Pension Andaina. I sidled up to the bar and ordered a café con leche. Sometimes you get a sweet treat when you order coffee, but this time it was warm churros and cake! Generous breakfast tapas on the Camino Inglés. Continued from Bruma, where two Caminos converge. What comes up must come down. Sure, it was a longer stage of 16 miles (25 km), but I was in for an easier walk on this day because it was mostly downhill, as the graph below shows. 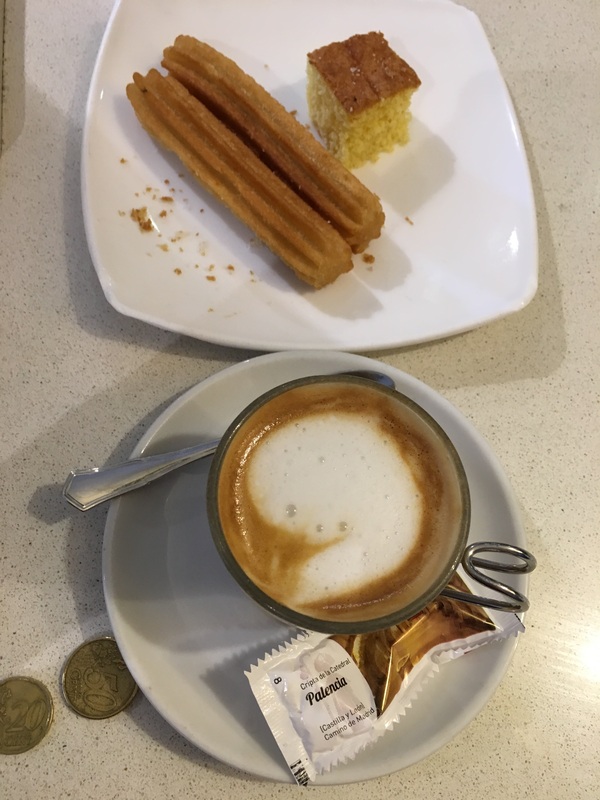 I was out bright and early (for me at least) because I stayed in a municipal albergue and pilgrims need to be out by 8 a.m. On my way out of town, I was hoping the Casa Graña was open for a café con leche. I had forgotten to get a stamp in my credential the night before. They were totally closed, but I spotted a cute bunny hopping around their patio. Here’s the video of the Bruma Bunny. Continued from Presedo to Bruma. After the rest break at the AC/DC mural, I had enough energy to forge ahead, and I had a good tune in my head. I was keeping a lookout for the place where the Camino Inglés routes (one starting in A Coruña and one in Ferrol) converge. I thought this fork in the path might be it, but the spray painted arrow on the tree was way too subtle. 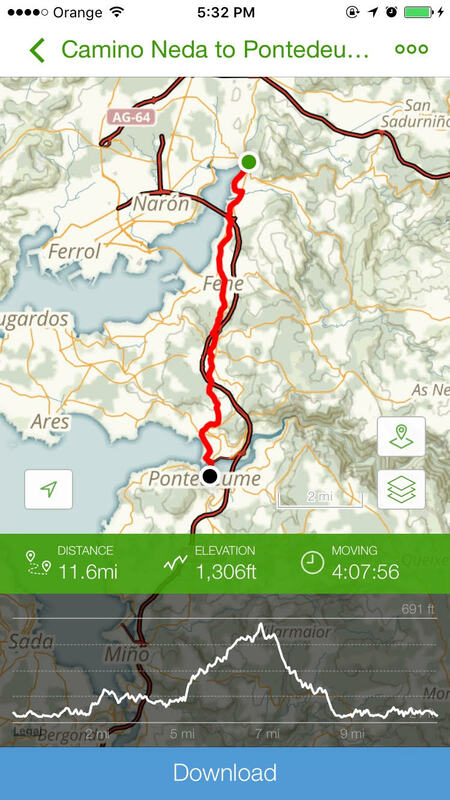 Continued from Betanzos to Presedo. 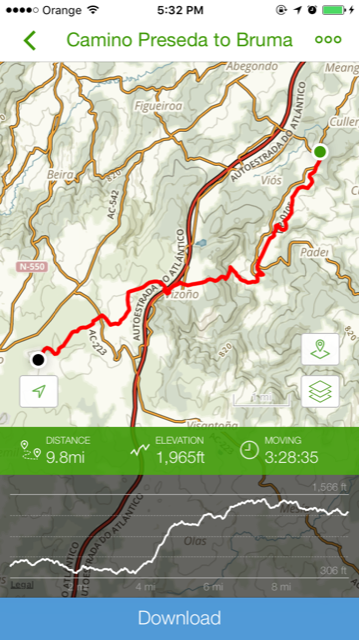 By splitting the Betanzos-to-Bruma stage (28 km), the walk from Presedo was more manageable at 10 miles (16 km). However, it had the steepest climb yet, with an elevation gain of nearly 2,000 feet. Leaving Presedo was pleasant. Even though it wasn’t raining, the air was cool and heavy with moisture. Perfect conditions for hiking the Camino. This day’s hike was short but sweet, because I split this most challenging stage by staying in Presedo. 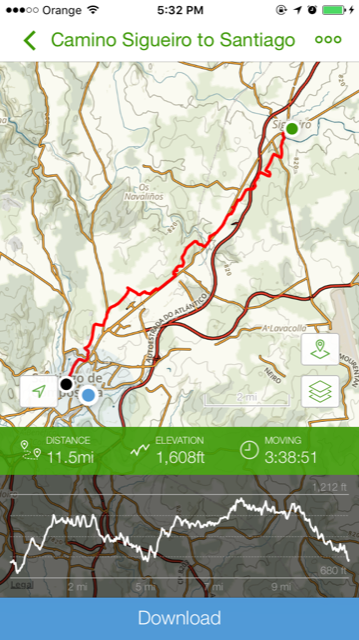 As my tracked hike screenshot shows, it was 8.5 miles (14 km), but it was still a challenging and hilly hike with a 1565 ft. elevation gain. It was a Dirty Girl gaiter and skirt day. The hike out of Betanzos was steep and went from cobblestone to asphalt to gravel, and eventually, dirt paths over rolling hills with farms. The entrance into Betanzos, a medieval town, is through the arched stone walls and cobbled streets. When I arrived, I was completely exhausted. Fortunately, the albergue had a friendly hospitalero, an available bunk bed, and because it was a newer municipal albergue, everything, including the bathrooms, was in much better shape. 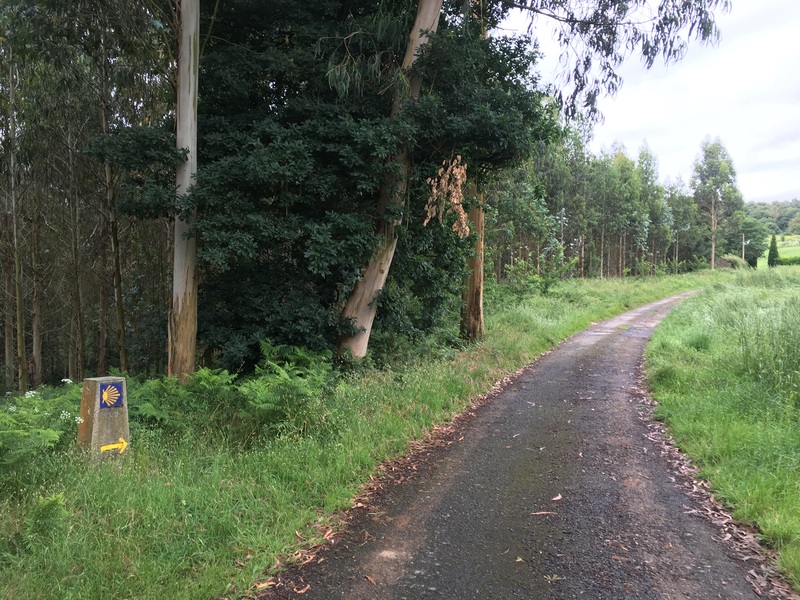 The Pontedeume-to-Betanzos stage was 22.5 km (14 miles) and was a steep climb for the first segment and more ups and downs throughout the day. The graph below shows how steep it was with a 2,270 ft. elevation gain! Next time I do this route, I will split this stage to stay in Miño so I can spend one more night by the river and have a more leisurely walk of roughly seven miles on both days. This will also allow for an earlier arrival in Betanzos, a town worthy of exploring more. After our amazing time frolicking in the waves at Playa Magdalena, Nancy and I headed to Pontedeume, which is just across a 14th-century bridge. My feet were a little salty and sandy from the beach so I walked those last couple of miles in my Z-Trail sandals, with my shoes strapped to my backpack. When I saw Nancy eating breakfast at Pensión Maragoto, she was already packed up and ready to head out for the day. I move a little slower in the morning, so I told her I would see her along the way. The laundry I had washed and hung on the windows was nice and dry, so I packed up and started walking around 9 a.m. I shot a quick video from the room before I headed out. 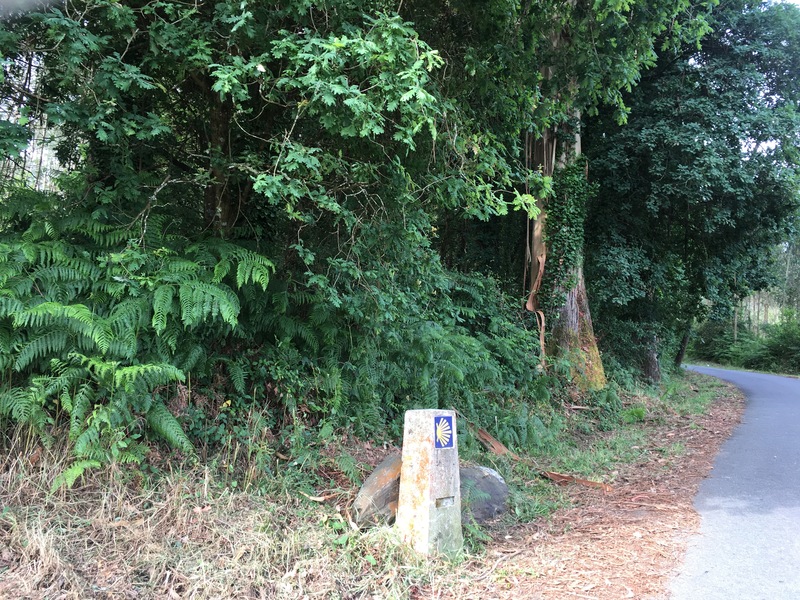 The Neda to Pontedeume stage was 18.7 km (11.6 miles) and followed the Ria de Ferrol for the first segment. 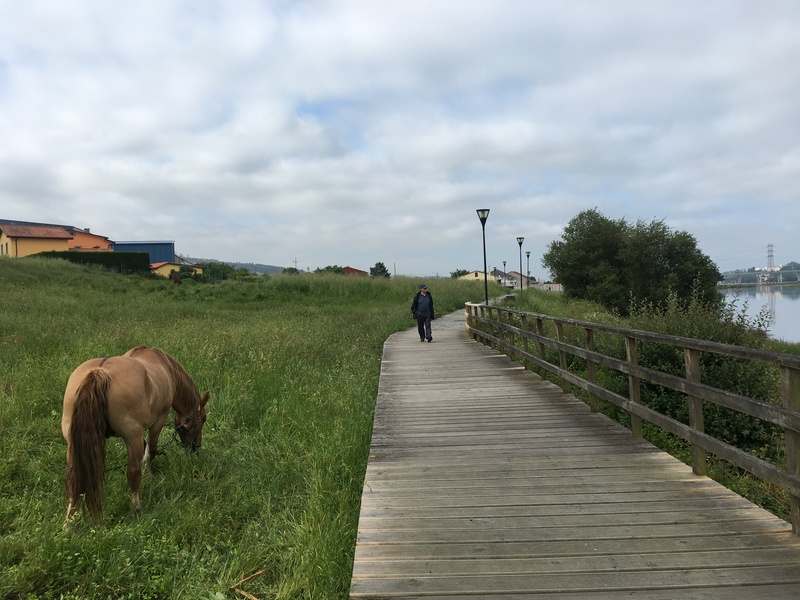 It was a peaceful walk along a boardwalk by the Ferrol river. I walked right by a horse and felt like I was back on the Camino Portugués.